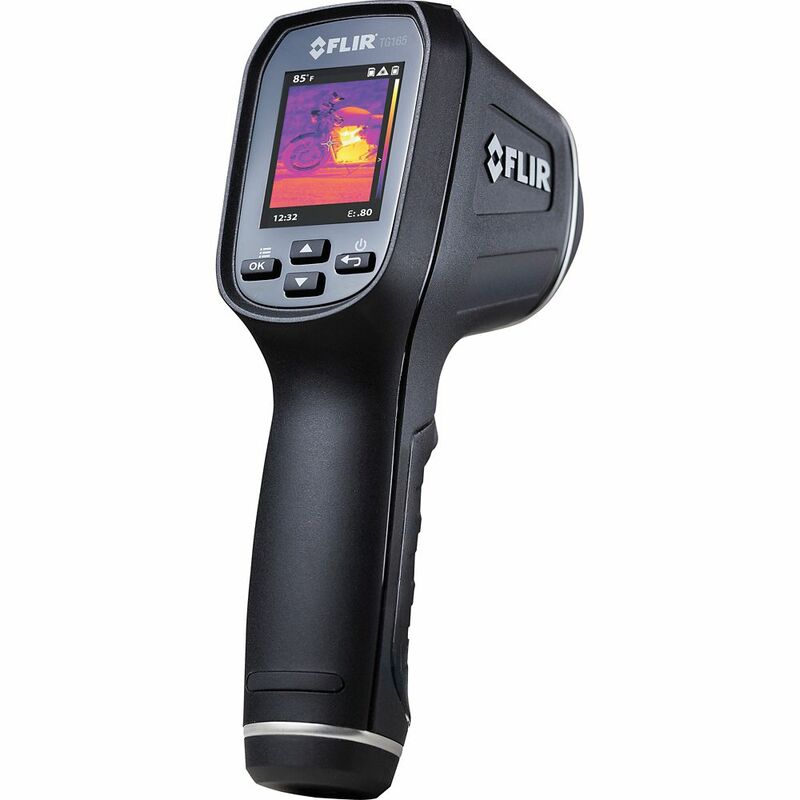 The FLIR Spot Thermal Camera bridges the gap between single-spot infrared thermometers and FLIR legendary thermal cameras. Equipped with a FLIR exclusive Lepton micro thermal sensor, this handheld device lets you see the heat so you know where to reliably measure it. Easily find unseen hot and cold spots for instant troubleshooting and store images and data to show customers and include in reports. The EX840 is a CAT IV True RMS clamp meter which features built-in IR thermometer with laser pointer for non-contact surface measurements from -58 to 518 degree Fahrenheit (-50 to 270 degree Celsius). Clamp measures AC current up to 1000 Amps with a maximum resolution of 0.1 Amp. The 1.7 in. jaw fits around conductors up to 750MCM. Peak hold captures motor inrush currents and other surges. Data hold and auto power off features. Other functions include AC/DC Voltage, resistance, Type K thermometer, capacitance and frequency. Complete with test leads, Type K temperature probe, 9 Volt battery and case. The EX623 is a TRMS AC/DC Clamp Meter that has dual thermocouple inputs for T1, T2, T1-T2 Differential Temperature measurement plus a built-in Infrared Thermometer with laser pointer for locating hot spots and NCV Detector. Additional features include: DC micro-amp function for flame rod measurements, Diode open circuit voltage of 2.8 Volt, Data Hold plus fast Peak Hold for capturing current surges at motor startup, and capacitance measurement to 40mF. Comes complete with test leads, 9 Volt battery, two Type K bead wire Temperature probes and carrying case. This Thermo-Anemometer features an Infrared Thermometer that measures remote surface temperatures to 932F (500C) with 30:1 distance to target ratio and Laser pointer. It can simultaneously display of Air Flow in CFM/CMM or Air Velocity Plus Ambient Temperature. Easy to set Area dimensions are stored in the meters internal memory for the next power on. Additional features include: large (9999 count) LCD backlit display, 20-point average for airflow, and a heavy duty rugged double moulded housing. Comes complete with vane sensor with 3.9ft (120cm) cable, software with cable, carrying case, and 9V battery. Designed to be rugged, the FLIR CM78 clamp meter delivers safety and versatilitywithout sacrificing high performance or innovation for tomorrows challenges. Take the CM78 on every job as it delivers with advanced meter functions including True RMS accuracy, AC/DC current and voltage measurement, resistance, capacitance, frequency, infrared and contact thermocouple temperature, diode-test, and continuity check. The 4-digit, 4,000 count display is LED-illuminated making it bright and easy to read anywhere. Several one-button functions including data hold, min/max, and selectable auto- or manual-ranging. A relative function helps you zero out the meter. The large 1.7 inch (42mm) jaw opening handles conductors up to 1500 MCM. The FLIR CM78 amp clamp has a CAT IV-600V, CAT III-1000V overvoltage safety rating. NIST certification is available for this product. The product comes with Clamp meter, CAT IV silicon test leads, 6 AAA batteries, and user manual/CD. TG165 Spot Thermal Camera The FLIR Spot Thermal Camera bridges the gap between single-spot infrared thermometers and FLIR legendary thermal cameras. Equipped with a FLIR exclusive Lepton micro thermal sensor, this handheld device lets you see the heat so you know where to reliably measure it. Easily find unseen hot and cold spots for instant troubleshooting and store images and data to show customers and include in reports. TG165 Spot Thermal Camera is rated 4.7 out of 5 by 58. Rated 5 out of 5 by Brucebuilder from We are a general contracting firm and we are doing a project on the first floor of a building whe... We are a general contracting firm and we are doing a project on the first floor of a building where there are copper heating pipes cast into the bottom of the concrete slab on the second floor above us. We called a concrete scanning company to try to find the copper so that we could anchor ductwork, piping and ceiling grid to the slab, but because the concrete slab is reinforced with rebar, the scanner could not differentiate between the copper and the rebar. This Flir Thermal Camera found the copper lines immediately because they were much warmer than the concrete slab, allowing us to find and mark all of them. It worked perfectly for our needs. Rated 3 out of 5 by Matt from This camera gets the job done, but I think the... This camera gets the job done, but I think the smart phone based cameras, such as the FLIR One, are better suited for a non-professional user such as myself. The main drawback with this camera is the small screen size. Rated 4 out of 5 by James from Interesting technology. It will take some months more to explore... Interesting technology. It will take some months more to explore the range of building applications under differing conditions: cold outside, warm inside vs hot outside, cool inside etc.Out of the box, I'd like to see a larger screen with better resolution. As a moderately priced thermal imager, it seems to work as advertised. It doesn't come with any sort of storage case or holster, so that's the first things needed before any field testing. I'm sure any dust on the lense will prove detrimental. Rated 5 out of 5 by ZZ502 from Worth every penny. Flir is a pioneer in infrared... Worth every penny. Flir is a pioneer in infrared technology, and I have used their stuff in the military. Don't settle for less with other brands. Rated 4 out of 5 by BMA architects from Useful to find air leaks and more As a professionnal, this tool can help to locate water and air leaks through building enveloppe before opening it. Must be used with care and knowledge of thermography limits. Rated 5 out of 5 by tg165 user from Handy little gadget I purchased the TG165 on sale to help figure out exactly why my home was so cold in the winter. Within minutes, I was able to locate which windows/doors were drafty, which walls were under-insulated, and which floors were unusually cold. The usefulness didn't stop there though: - It helps figure out which HVAC registers are working well, and which ones aren't - In some cases, it helps figure out where (hot) plumbing lines, HVAC ducts and sometimes even studs/rafters are behind walls or ceilings - It can help spot uneven loading in an electrical panel - It can be used to identify electrical devices that are wasting power when plugged in - It helps locate in-floor heating cables/piping The only drawback for this particular model is that the field of view is a bit small, and everything in that view is dynamically-scaled so that the hottest thing is the brightest, and the coldest thing is the darkest. If what you're looking at has one really hot spot and many cold spots, then it becomes difficult to see the variation in the cold spots until you block out the hot spots. An example would be if you're looking at a ceiling with recessed lighting; you have to wait for the bulbs to cool down in order to see the cold spots correctly. Also take note that looking at shiny or reflective surfaces can confuse the sensor (glass, mirrors, or silver HVAC ducting). Rated 5 out of 5 by Bill from Perfect fit!... Perfect fit! Rated 5 out of 5 by Bill from Does everything I need it to do and yes it... Does everything I need it to do and yes it does see into walls when the temperature difference is notable between the framing and the outer layers including plaster. Impressed with Flir!